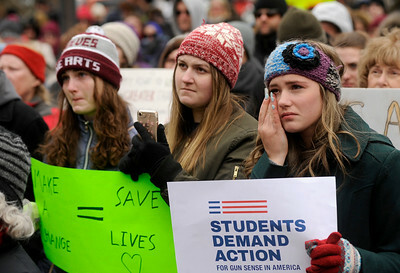 Gregory Shaver for Shaw Media Sonya Sindberg, left, and her sister, Peri, right, comfort their younger sister, Ali, center, as they listen to stories from Majory Stoneman Douglas High School students are read during the March for Our Lives rally Saturday afternoon, March 24, 2018, in the Historic Woodstock Square. 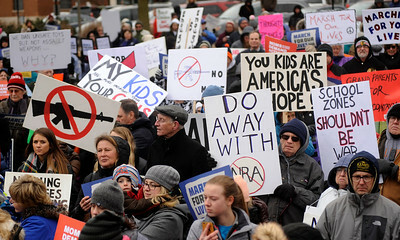 The rally and march was one of over 800 from around the country planned by students and survivors of gun violence in communities big and small calling for lawmakers to make students’ lives and safety a priority and to pass common-sense gun safety legislation. 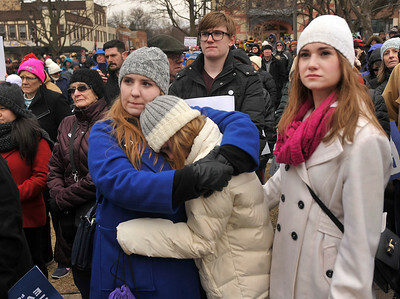 Gregory Shaver for Shaw Media Prairie Ridge High School students Elly Flemming, left to right, Sydney White, and Samantha Hemstreet, wiping away a tear, listen as stories from Majory Stoneman Douglas High School students are read during a March for Our Lives rally Saturday afternoon, March 24, 2018, in the Historic Woodstock Square. The rally and march was one of over 800 from around the country planned by students and survivors of gun violence in communities big and small calling for lawmakers to make students’ lives and safety a priority and to pass common-sense gun safety legislation. 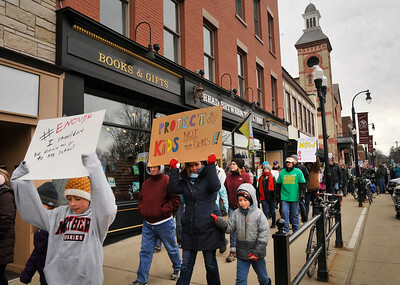 Gregory Shaver for Shaw Media Protesters listen to a Crystal Lake South student speak during the March for Our Lives rally Saturday afternoon, March 24, 2018, in the Historic Woodstock Square. The rally and march was one of over 800 from around the country planned by students and survivors of gun violence in communities big and small calling for lawmakers to make students’ lives and safety a priority and to pass common-sense gun safety legislation. Gregory Shaver for Shaw Media People snap photographs as protesters gather for the March for Our Lives rally Saturday afternoon, March 24, 2018, in the Historic Woodstock Square. The rally and march was one of over 800 from around the country planned by students and survivors of gun violence in communities big and small calling for lawmakers to make students’ lives and safety a priority and to pass common-sense gun safety legislation. 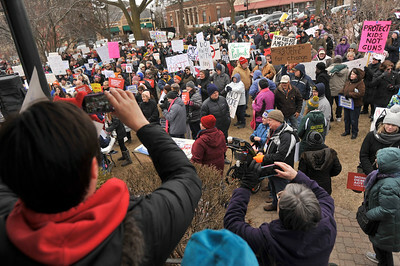 Gregory Shaver for Shaw Media Protesters march around the Historic Woodstock Square during the March for Our Lives protest Saturday afternoon, March 24, 2018. The rally and march was one of over 800 from around the country planned by students and survivors of gun violence in communities big and small calling for lawmakers to make students’ lives and safety a priority and to pass common-sense gun safety legislation. 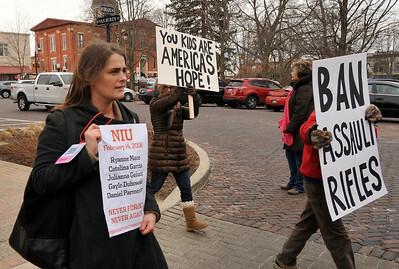 Gregory Shaver for Shaw Media Kayla Borton, a survivors of the Northern Illinois University shooting in 2008, march with other protesters around the Historic Woodstock Square during the March for Our Lives protest Saturday afternoon, March 24, 2018. The rally and march was one of over 800 from around the country planned by students and survivors of gun violence in communities big and small calling for lawmakers to make students’ lives and safety a priority and to pass common-sense gun safety legislation. Gregory Shaver for Shaw Media People hold up signs during a March for Our Lives rally Saturday afternoon, March 24, 2018, in the Historic Woodstock Square. The rally and march was one of over 800 from around the country planned by students and survivors of gun violence in communities big and small calling for lawmakers to make students’ lives and safety a priority and to pass common-sense gun safety legislation. Gregory Shaver for Shaw Media A student hold to sign during a March for Our Lives rally Saturday afternoon, March 24, 2018, in the Historic Woodstock Square. The rally and march was one of over 800 from around the country planned by students and survivors of gun violence in communities big and small calling for lawmakers to make students’ lives and safety a priority and to pass common-sense gun safety legislation. 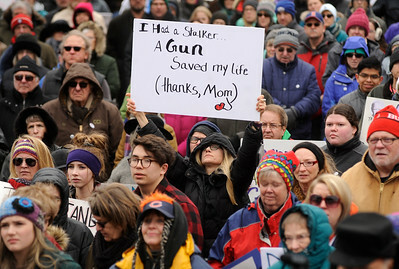 Gregory Shaver for Shaw Media Kathleen Larimer, the mother of John Thomas Larimer a victium of the Aurora, Colorado movie theater shooting, speaks during a March for Our Lives rally Saturday afternoon, March 24, 2018, in the Historic Woodstock Square. The rally and march was one of over 800 from around the country planned by students and survivors of gun violence in communities big and small calling for lawmakers to make students’ lives and safety a priority and to pass common-sense gun safety legislation. 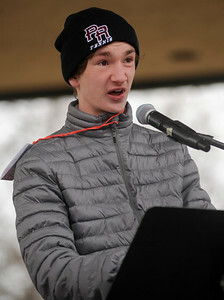 Gregory Shaver for Shaw Media Max Kueller, a Prairie Ridge High School student, reads a story from Majory Stoneman Douglas High School student during a March for Our Lives rally Saturday afternoon, March 24, 2018, in the Historic Woodstock Square. The rally and march was one of over 800 from around the country planned by students and survivors of gun violence in communities big and small calling for lawmakers to make students’ lives and safety a priority and to pass common-sense gun safety legislation. 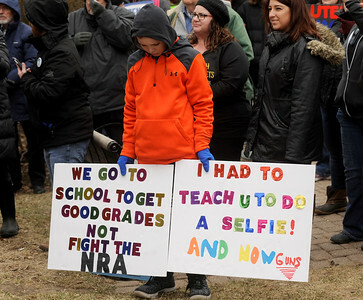 Gregory Shaver for Shaw Media A gun supporter, who refused to give her name hold up a sign in the middle of the crowd at the March for Our Lives protest Saturday afternoon, March 24, 2018, in the Historic Woodstock Square. The rally and march was one of over 800 from around the country planned by students and survivors of gun violence in communities big and small calling for lawmakers to make students’ lives and safety a priority and to pass common-sense gun safety legislation. 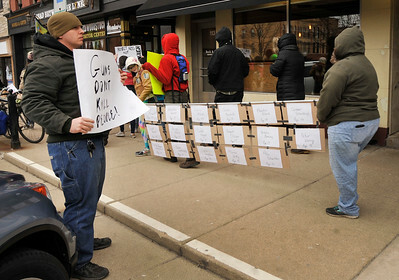 Gregory Shaver for Shaw Media Daniel Thoma, a gun supporter, protests as people march around the Historic Woodstock Square during the March for Our Lives protest Saturday afternoon, March 24, 2018. The rally and march was one of over 800 from around the country planned by students and survivors of gun violence in communities big and small calling for lawmakers to make students’ lives and safety a priority and to pass common-sense gun safety legislation. 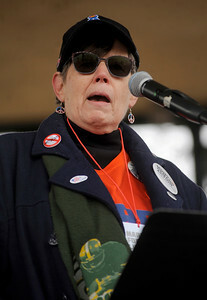 Kathleen Larimer, the mother of John Thomas Larimer a victium of the Aurora, Colorado movie theater shooting, speaks during a March for Our Lives rally Saturday afternoon, March 24, 2018, in the Historic Woodstock Square. The rally and march was one of over 800 from around the country planned by students and survivors of gun violence in communities big and small calling for lawmakers to make students’ lives and safety a priority and to pass common-sense gun safety legislation.